shame on me! I dont check the settings … thank You! On tuts video, in debug mode, i can see log list of action. But on video log more clear, without reports about mouse route movement, 2d move steps and wheel scroll. how to exclude movements and zoom wheel in the debug log? Afaik we can’t hide these log messages. Looks like they were added in recent Blender versions. Dear roaoao, I found the following thing. If you download Blender3d from the official site, and go from the main page by clicking on the Download tab at the top of the page - you get another distribution. Truncated, trimmed and smaller on 20 megabytes. It lacks many api-files to work in Windows. If for some reason they are not in the system, not installed updates or something else, then your Blender starts to work unstable. Or the modules and addons stop working as expected. Official, from blender.org - not full - 110 mb zip x64, does not include much. That can lead to errors, fall and incorrect work of addon`s! Not only pie editor. Dear roaoao, thanks again for this wonderful addon. I was wondering if there is a way to access bpy.data.node_groups so that I could create a popup menu to quickly pull up different node trees in the node editor. In other words, I would like to be able to access the pictured drop-down menu. I was wondering if there is a way to access bpy.data.node_groups so that I could create a popup menu to quickly pull up different node trees in the node editor. Hey roaoao, thanks so much for you answer. Tried it out, i’m wondering if there is a way to describe a condition so that only animation nodes node groups art called up. Currently my material groups are also being brought up. i’m wondering if there is a way to describe a condition so that only animation nodes node groups art called up. I just fixed my Vertex, Edge, Face mode. You can use this. You can change type= to VERT or EDGE or FACE. use_extend is if it’s going to shift add to whatever type you’re editing. If editing vertices, and type=‘FACE’ with extend it’s going to edit Vertices and Faces etc. I chose it to be False in my example. @roaoao I have a question, this is a tricky one for me to get into a pie. 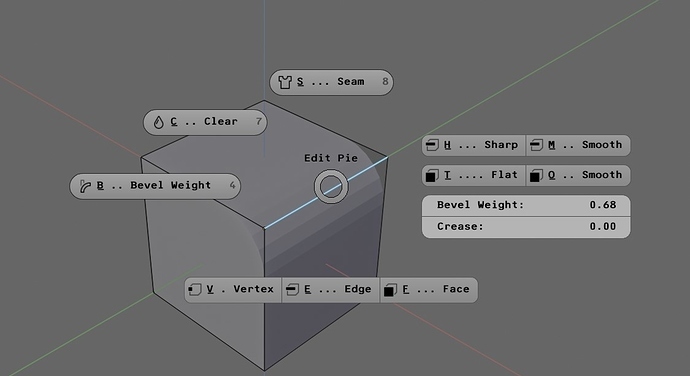 If I have edges selected, do you know if I can get Bevel Weight and Crease Weight number input fields into a menu. Edge Data. It resides in properties panel. 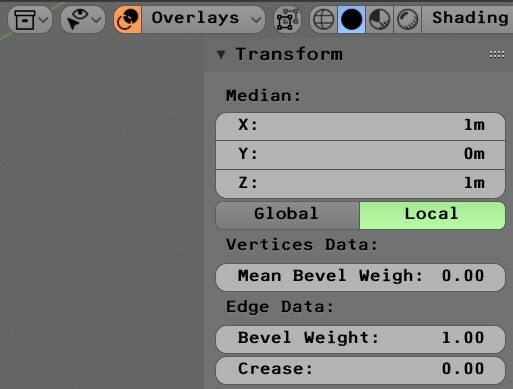 They change depending of numbers of edges selected to display Mean Bevel Weight etc. It’s not a show stopper, but it would be neat if I could get it into one of my pie menus. Thanks for taking the time to respond. If anyone else knows a way feel free to respond. In my example it shows crease/bevel weight value of the first edge in the selection (to speed up the code). But you can modify the code (getter). In the post you say use in Menu tab, I though it would go in Command tab. I get syntax error. copied both code from post, and the .json file. Has some API changes been done since that post that breaks the code snippet. Can you send me a screenshot with the error? I’ve just tried the example in both Blender 2.79 and 2.80 and it works. I don’t get anything in the system console. I’ve tried to enable debug mode, but don’t know where to look. Am I doing it wrong? No, you need to import json file and use Edge Crease and Edge Bevel Weight in your pie (Menu) tab. I am stupid, now it makes sense. Imported the json, now just under Menu tab, I can add Bevel Weight and Edge Crease. Thanks again! works like a charm. This add-on is among my absolute favorites. A must have, can’t stop recommend it enough. When calling a pop up from a pie (with expand checked), is there a way to adjust the width of the popup? the popup settings (gears icon) don’t seem to have an effect when called this way. I’m not sure how to make this function, or the “Add Iterator” functions contextual, so that I could add an iterator or parameter to any Loop node with a pop-up? I’ve made a Stack key to switch between trackball and turntable orbit modes since switching between the two makes getting the best camera orientation easier. Easily be done w/pme. This is great, since switching isn’t easy otherwise. However, I was wondering if a modal operator could be made so that the orbit mode switch is automatic. For example, the default view.rotate mode is turntable, but holding shift+ctrl and dragging mmb would initialize view.rotate with trackball.